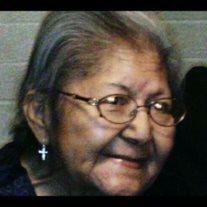 Frances Loretta Goodwin, 78, of Phoenix, Arizona passed away March 13, 2014 in Phoenix. Wake services will be held Friday, March 21, 2014 at 6 PM at Salt River Memorial Hall, 9849 E. Earll Drive, Scottsdale, AZ. A graveside service will be held Saturday, March 22, 2014 at 8 AM at Salt River Cemetery, 10661 E. Palm Lane, Scottsdale, Arizona. Arrangements by Bunker’s Garden Chapel.